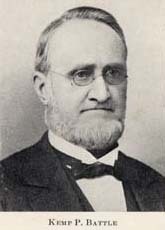 Kemp P. Battle (Kemp Plummer), 1831-1919 History of the University of North Carolina. Volume II: From 1868 to 1912. History of the University of North Carolina. Volume II: From 1868 to 1912. Raleigh: Edwards & Broughton Printing Company, 1912. Higher education and state -- North Carolina -- History. Universities and colleges -- North Carolina -- History.